The company started to develop an eight-gear automatic transmission in 2007. At that time, it was lack of technology, talent and product. After 10 years' hard work, it finally introduced the first front-engine, front-drive eight-gear auto transmission in the world, according to the company. Shengrui's 8AT won the National Science and Technology Progress Award in January last year. The award is one of China's top prizes devised by the State Council in recognition of scientific contributions made by either groups or individuals. The company was the first auto parts supplier to obtain that recognition since the award was created in 1984. The innovation not only reaps tremendous economic benefits for the company but also has significant impact on China's auto manufacturing industry, according to the management of the company. China has become the third country in the world to successfully develop the 8AT after Germany and Japan. Shengrui's 8AT also pushes foreign companies to lower their product prices in the Chinese market, which helps Chinese automakers significantly lower their costs, according to the company. Shengrui rolled out the third generation of 8AT, which is more energy efficient and smarter than previous incarnations. The latest 8AT can be equipped on some vehicle models developed by FAW Group, according to the company. 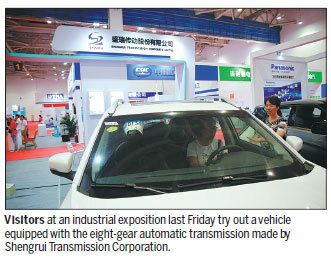 Shengrui displayed its new energy products at Auto China in April in Beijing. It reached cooperation consensus with two automakers at the expo. It plans to establish partnerships with eight automakers. It also plans to further expand its production capacity. Shengrui's annual production capacity hit 250,000 units at the end of July. With the 8AT, Shengrui not only achieves rapid growth on its own businesses, but also supports the development of an industrial chain covering components such as clutches and bearings. By the end of this year, Shengrui will have a production line with 300,000 units, according to the company. The production line, meeting standards required by Industry 4.0, will be capable of producing traditional 8AT and new energy products by then. Wang Lian contributed to this story.